ORANGE PARK, FL – August 16, 2017 – PetCure Oncology at SEVO-Med is officially open and treating patients, marking the arrival of a new, potentially life-saving cancer treatment for pets in northeast Florida. in his leg and metastatic lesions in his lungs. Stereotactic radiosurgery (SRS) has emerged as a standard of care in human oncology over the last few decades, but has only recently become available in veterinary medicine. Less than 20 specialty centers across the country possess the technology and clinical expertise to provide SRS for pets. That list now includes Southeast Veterinary Oncology and Internal Medicine (SEVO-Med), northeast Florida’s leading provider of veterinary oncology. The upgrade at SEVO-Med was made possible by a partnership with national cancer care provider PetCure Oncology, the industry leader in radiation oncology for pets and the leading provider of veterinary SRS. PetCure Oncology at SEVO-Med is led by Dr. Tracy LaDue, a double-board certified veterinary specialist in radiation oncology and medical oncology. Well-regarded for her high level of veterinary care and compassionate support for pet families, Dr. LaDue has been a practicing radiation oncologist for nearly two decades. She has been treating Jacksonville-area pets with cancer since opening SEVO-Med in 2004. The progressive cancer care offered by PetCure Oncology at SEVO-Med is already making a difference in the lives of pets and their families across the country. PetCure Oncology centers have treated nearly 1,000 pets with cancer in just over two years of operation. Two-thirds of all PetCure clients have elected to pursue SRS as their preferred treatment option, taking advantage of its unprecedented precision. The resulting benefits include an 80-95% reduction in treatment sessions and anesthetic events, minimal side effects, and typically immediate improvement to quality of life. SRS has also emerged as a viable treatment option for some cancers previously considered “untreatable” based on its ability to target tumors embedded in complex locations. About: PetCure Oncology, the leading provider of SRS for pets in terms of both treatment centers and patients treated, operates a seven-center national network supported by an elite clinical staff that includes multiple board-certified veterinary radiation oncologists. From industry-leading clinical research to unprecedented quality assurance measures rooted in human medicine, PetCure’s pioneering innovations have led to a quality of treatment and delivery that is unrivaled in veterinary oncology. To learn more, visit PetCureOncology.com or call (773) 850-3400. 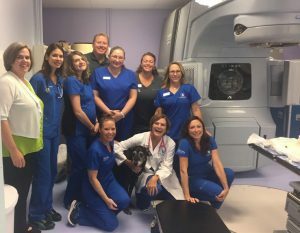 About: SEVO-Med, the leading veterinary oncology provider in northeast Florida, was one of the first oncology-specific veterinary specialty practices in the country upon opening in 2004. SEVO-Med offers a full-continuum of health services ranging from oncology to internal medicine and including regular collaboration with specialists across all service areas – all in a relaxed, comforting environment designed to best suit the needs of patients and pet families alike. Visit SEVOMed.com for more information.